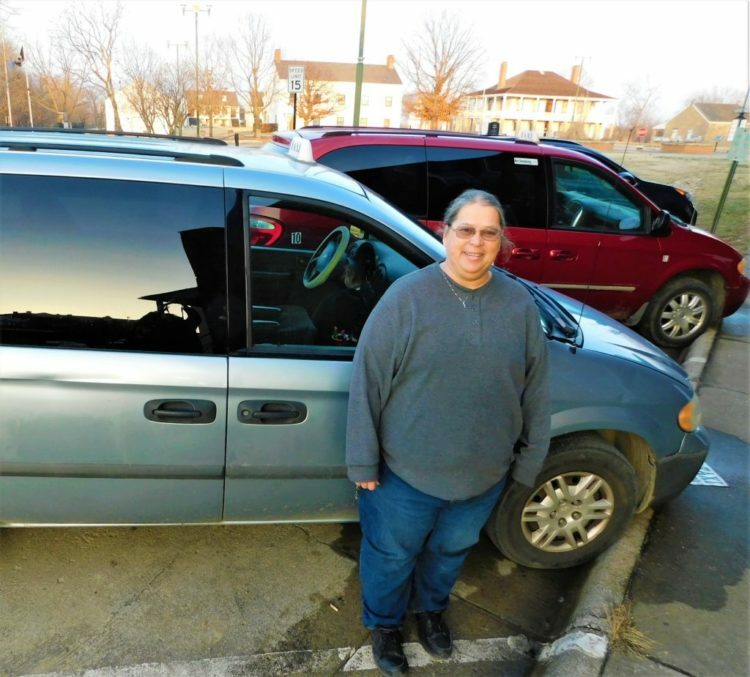 Jackie Sellers stands in front of the two vans that were purchased by Old Fort Transportation LLC to provide public transportation to the community. Sellers and her husband, James are the new owners of the business. Fort Scott National Historic Site is in the background. 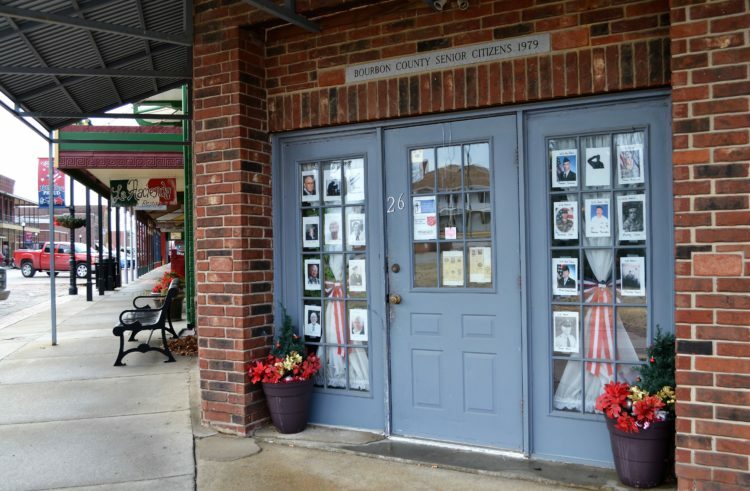 The business is located at the very north end of Main Street, housed in the Bourbon County Senior Citizens Center. Old Fort Transportation, LLC, owned by Jacqueline and James Sellers, took over public transportation from Pitt-Taxi on Jan. 1, 2019. Sellers is no stranger to public transportation in Fort Scott. Through the years, Sellers got to know those that used the service. During that period of time public transportation was providing over a thousand rides a month, she said. 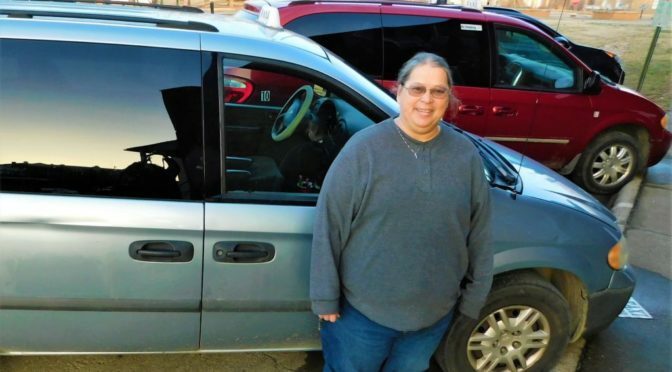 In late 2018, the owners of Pitt-Taxi made a decision to retire. The business primarily provides transportation in Fort Scott, and when possible, the surrounding areas, she said. Old Fort Transportation LLC is located at 26 N. Main, in the Bourbon County Senior Citizens Center. Bourbon County Senior Citizens Center, 26 N. Main. “You can’t miss the vehicles (two vans) parked on Old Fort Blvd., she said. The phone number is still the same (620)249-1440. Regular hours of operation are Mon. through Sat. 6 a.m. to 6 p.m. The full cost of a ride is $6. “There is a discounted rate of $4 for senior citizens and those who have a commodity card or a Beacon card,” she said. The public transportation business provides an average of 900 rides a month. Shopping – G &W Grocery Store, Walmart, Dollar General, Tractor Supply, Price Chopper Grocery Store, and downtown shops. Medical appointments – Mercy, Urgent Care, Dr. Kellenburger, Baker Clinic, eye doctors, dentists, WIC, Mental Health clinic, and I Am Rehab. Work – restaurants and fast food places, Walmart, G and W, Price Chopper, Extrusions, Peerless, Timken, First Source, Valu Merchandise, Nursing homes, and individual homes. Other- banks, post office, library, Fort Scott Community College, Bourbon County Court House, jail, Fort Scott City Hall, cable office, bill pay centers, automotive repair, nursing home to visit, restaurants and fast food places to eat. Jackie, I was so glad to hear you and your husband took over the taxi business. I don’t use it at this time but never know when I might have to use it. I did in the past. I know you will do a good job with it. I am sure you will be kept busy.